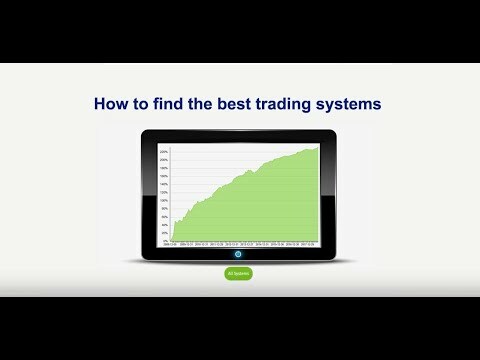 On the PlentyTrade platform you will find a variety of tested and proven trading systems. But the peculiarity of PlentyTrade is that the trading systems shown here only trade in one market at a time. That is: a currency pair, a trading system. This will allow you to create well-diversified portfolios later, with the monitoring of each system becoming an easy task. The selection of currency pairs shown here is limited to the most traded currencies. This makes sense, as they usually have a lower spread compared to exotic currency markets. Perfect for a trader, as a low spread also means lower costs per transaction and therefore more profit. On the right side of the website is a button called All Systems. Clicking on it opens the trading system list (TSL) with all systems, small charts and some statistic key figures. By default, you can see the best trading systems for all currency pairs from the last three months. By clicking on the button All systems on the right side, you open the system window. The system window will initially display the best performing systems. It is, however, limited to a maximum of ten systems. A scroll bar on the right side will take you down further. For an individual selection, simply click on the currency pair selection in the upper gray background in TSL, to the right of the Plenty EA / Demo EA button. This opens a menu with all currently trade-able markets for which trading systems are available on our platform. Here you can also display sample portfolios (click on green to show). Right next to the currency pair selection you will find the symbol for the sorting function. With one click, a ranking function opens, through which you can also adjust the order of the displayed systems according to your needs. Now that you have arranged the systems to your liking, you can take a closer look at a system by clicking on the system name. You will then be presented with a large chart, a description, all the important statistics, all trades and an MT4 report. If you want to look at another system, simply open the TSL again and select the next system by its name. By clicking on the system name (in picture GBPJPY_H1_004), you simply select your desired system, in which you want to take a closer look at the chart and the associated statistical key figures. Each system has its own risk setting. By default, systems have been tested and traded at one percent per trade risk. Use the – and + keys to adjust the percentage risk per trade according to your own needs. At the same time, this is the only setting you need to make on a system. THAT is the simplicity of PlentyTrade. Complicated settings are not necessary at all. But it should also be clear that risk and return are always very closely related. Understandably, a lower risk will lead to a lower yield and vice versa. For example, a risk of 1.0 percent means that if you have an account size of $ 1,000, you risk $ 10 per trade. A risk of 3 percent would then result in $ 30. PlentyTrade has no complicated settings or calculations. The most important thing about trading is always controlling the risk. That is why we have a visual screen that implements the risk control indicator. This gives you an idea of ​​the fluctuations in the system you have considered in the past. You can then use the + and – keys to adjust the risk to your own individual needs. The risk control screen shows you exactly what risk the selected system has had in the period you have set. To customize a system, just use the – and + keys ( ) in the TSL on the right. There are currently no systems matching these criteria. Please try again later. PlentyTrade GmbH offers a software called "Plenty EA". With this software, information can be received from exchange trading systems that are available on the website plentytrade.com. "Plenty EA" must only be installed, configured and controlled by the user on his trading account. The user is responsible for the proper installation and operation of "Plenty EA" on his trading platform & account. In order to obtain information from exchange trading systems, the user must purchase the software. The performance of the above stock exchange trading systems shown on our website is not a reliable indicator of future developments. PlentyTrade GmbH does not make any recommendations on the use of the stock exchange trading systems provided. PlentyTrade GmbH is not a broker and does not carry out any transactions requiring approval.